I’m here at the Extreme Solar Systems 2 conference in Jackson Hole, Wyoming. 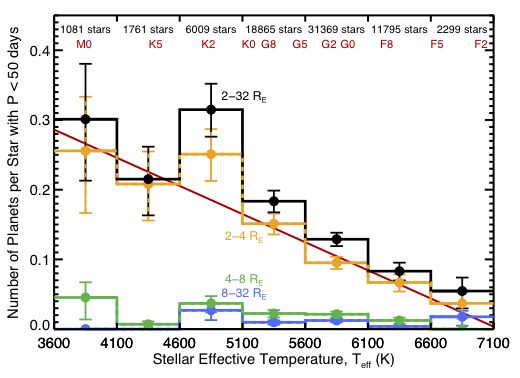 On Monday, Sarah Ballard spoke about recent results on the Kepler-19 system; she led a paper on this object that was posted to the arxiv last week. This is the story of the newly-discovered transiting planet Kepler-19b and its mysterious companion. Authors: Sarah Ballard et al. Kepler-19 started out as Kepler Object of Interest (KOI) 84, just another target of the Kepler transiting planet survey. KOI-84 has racked up two years of observations, first at “long cadence” with exposure times of 30 minutes and then – when noted to be an interesting object – at “short cadence” with 1 minute exposures. 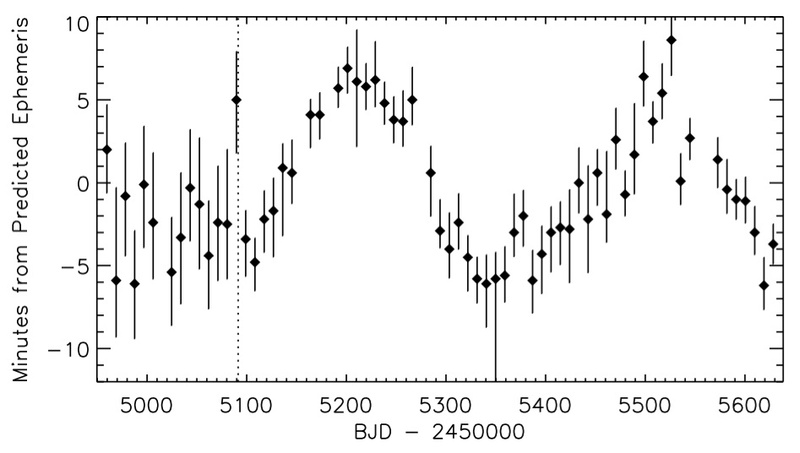 Once the light curve has been cleaned up by the Kepler data reduction pipeline, the transits of planet candidate KOI-84.01 are apparent. 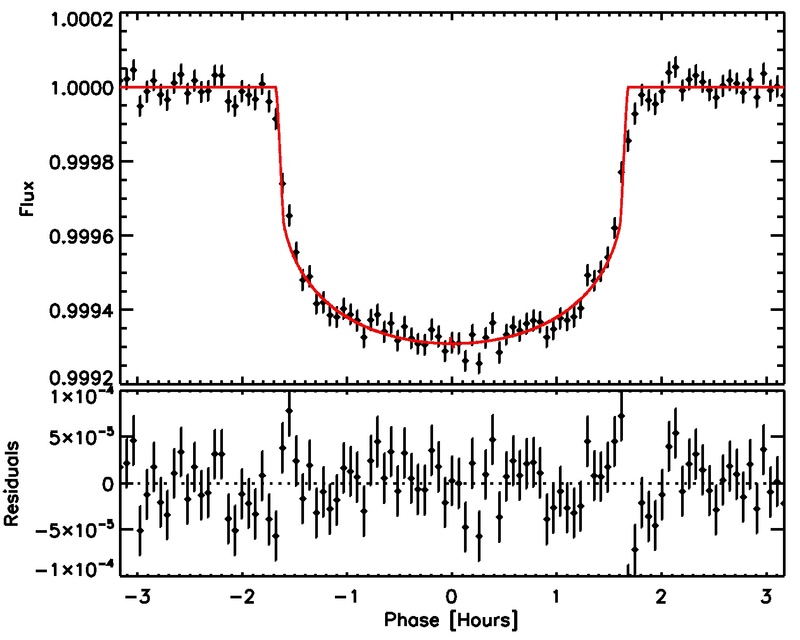 The typical procedure for analyzing such a light curve is to look for the model that best fits the observed transits. Included in that model are parameters such as the period, inclination and semi-major axis of the planet’s orbit and the planet’s radius. (The inferred radius and the semi-major axis depend the star’s radius, which is constrained using other data.) With the orbital period now determined, the light curve is “folded” on itself; that is, all the transits are aligned based on the determined period and stacked up. When Ballard et al. carried out this procedure for KOI-84.01, the stacked transits didn’t look right: the edges of the transits weren’t abrupt drops in flux, but instead looked slightly smeared out. You can see this in the figure to the right, near the beginning and end of transit. None of the planet parameters could be changed to provide a better fit to the data; neither could varying the stellar parameters alleviate the issue. Instead, the authors turned towards their assertion that the transits were equally spaced in time. When relaxing this assumption and allowing the transit time to vary in addition to the other parameters, the authors can fit the data very well. The candidate is found to be a 2.2 Earth-radius planet with a 9.3-day period. Is this object really the planet we think it is? Because the radial velocity measurements of this candidate resulted in a non-detection (it’s a small object! ), a second, independent verification of its planetary nature isn’t possible. In Kepler lingo, then, KOI-84.01 can’t be confirmed as a bonafide planet. But it can be validated if all non-planetary causes of the putative transit can be ruled out. The authors turn to the BLENDER software for this work (see Courtney’s astrobite for details on how BLENDER works). To make a long story short, all non-planetary scenarios can be ruled out to high confidence: the probability that the signal is due to a 2.2 Earth-radius planet is 7000 times more likely than other scenarios! With this, KOI-84.01 has been validated and given the new name Kepler-19b. But what about the fact that some transits of Kepler-19b arrive early and some arrive late? Ballard et al. argue that the cause of these transit timing variations is a second yet-unseen planet whose gravitational influence perturbs the orbit of the first. The sinusoidal variation in the transit time is exactly what one would expect in this case, but there are also other causes that must be eliminated as possibilities. The authors rule out intrinsic stellar variability (there is no evidence for magnetic activity or spots), precession of the planet’s orbit (it could not produce the large variations detected) and a distant stellar mass body (there would be a radial velocity signal, which was not detected). Having rejected these other scenarios, Ballard et al. conclude that the transit timing variations are the effect of a second planet and call it Kepler-19c. We know almost nothing about Kepler-19c except that it exists: the orbit and mass of the second planet can’t be constrained from the transit timing signal. The authors have considered a variety of different perturbing objects: interior and exterior planets, planets on eccentric orbits and on circular orbits and even a distant moon. Although some of the possible perturbations will give rise to different transit timing signals over time, others will be difficult, if not impossible, to disentangle. So at least for now, the nature of Kepler-19c will remain a mystery. 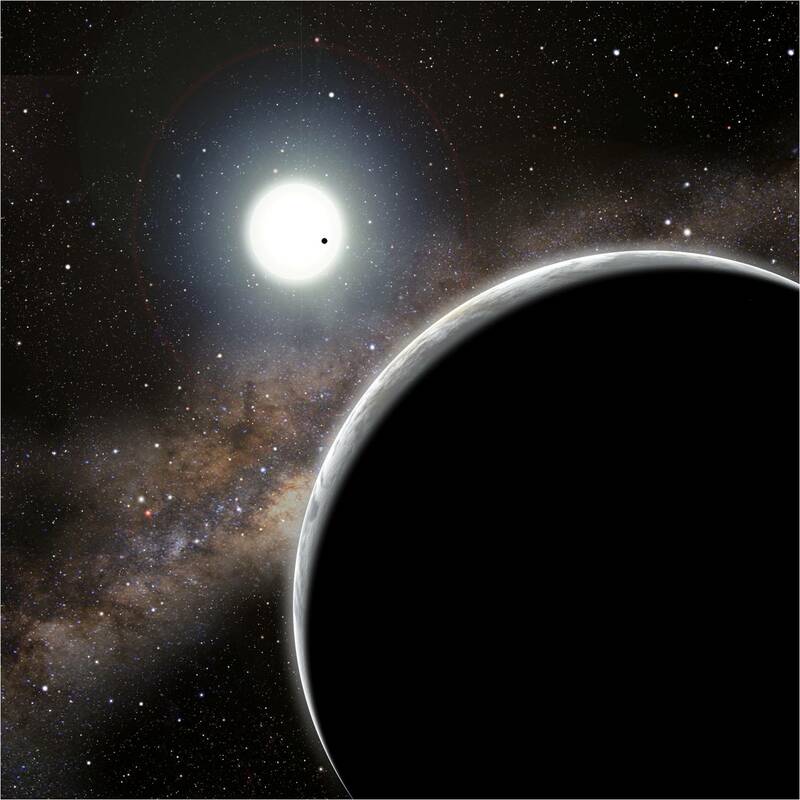 The transiting planet Kepler-19b is shown silhouetted against its host star while in the foreground is Kepler-19c, in shadow. From kepler.nasa.gov; image by David Aguilar.